Arsenic is a harmful heavy metal known to cause cancer, kidney damage and diarrhea. It is both naturally occurring and inorganic. 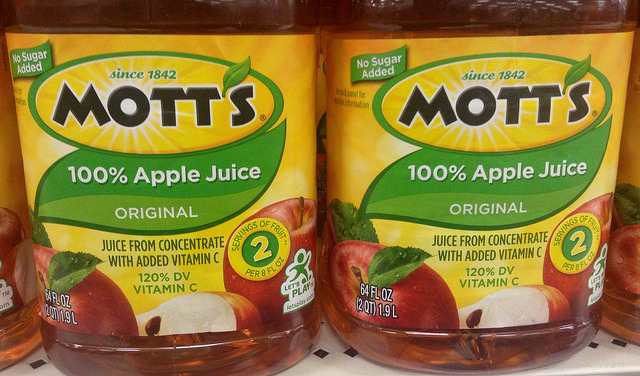 American apple juice is made from apple concentrate. There can be apple concentrate from up to seven countries in one kind of Apple juice. Although arsenic, a heavy metal carcinogen, has been banned in the US for decades, it’s not always regulated in other countries where it may be in the water supply or used in pesticides contaminating the juice. After testing dozens of samples from three different cities in America, Dr. Oz discovered that some of the nation’s best known brands of apple juice contain arsenic. 60% of apple juice concentrate is imported from China. Consumer Reports released its own investigation into arsenic in the food supply. It found 10% of apple juice and grape juice samples had total arsenic levels (that were inorganic, carcinogenic kind) above the drinking water standard of 10 parts per billion. In an email sent to Dr. Oz, the FDA said they are “researching the new evidence suggesting the majority of arsenic in apple juice is inorganic.”, and went on to say that there are two forms of organic arsenic in apple juice that are also potentially harmful. The inorganic form of arsenic is more acutely dangerous and vastly more carcinogenic, according to the CDC. The FDA also disclosed new data from the monitoring program for arsenic in juice. Nine test results reported arsenic levels above 23 parts per billion, the current level of concern. The EPAs limit on arsenic in drinking water is 10 parts per billion. After testing dozens of samples from three different cities in America, Dr. Oz reviewed 10 samples came back higher than the arsenic limit allowed in drinking water. In July 2013, the FDA established an “action level” of 10 PPB for apple juice, and began refusing imports and demanding recalls for domestic products exceeding this level. The final stage of the poisoning causes the patient to suffer seizures and go into shock, leading to coma and/or death. Blood, urine, hair, and nails may be tested for arsenic. Urine tests would have to be carried out within 1-2 days of the initial exposure for accurate level reading. 1. Bowel irrigation. Large amounts of polyethylene glycol solution is passed through the entire gastrointestinal tract to flush it out. The International Agency for Research on Cancer (IARC) recognizes arsenic and arsenic compounds as group 1 carcinogens.